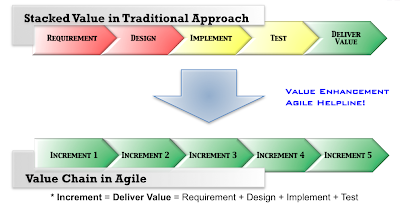 Agile product development is growing fast with intense focus on perfecting Agile execution. However, the business strategies developed by many organizations are still non-agile. For example, Agile product development teams are pushing business owners to prioritize the product backlog to deliver the highest value features in each iteration. However, business owners are not necessarily providing prioritization based on the organization's business strategy. A successful business strategy involves making choices throughout the value chain that are interdependent. For an organization to realize the full benefit of it’s business strategies it must develop and maintain them using an Agile approach. The following video explains Agile Strategy Manifesto. You can also watch it on youtube. Agile mentality: An agile organization is a fast moving, adaptable and robust business. It is capable of rapid adaptation in response to unexpected and unpredicted changes and events, market opportunities, and customer requirements. Its mentality is founded on processes and structures that facilitate speed, adaptation and robustness and that deliver coordinated results that are capable of achieving competitive performance in a highly dynamic and unpredictable business environment. Iterative approach (inspect and adapt): In today’s competitive world, long-term strategies cannot be taken for granted. With technological advancement, time to market is shrinking which results in continuous validation of strategies through constant customer feedback and new competitor’s innovation. All elements of strategic lifecycle need to be iterative. Strategic leaders must inspect and adapt on a continuous basis to remain competitive. Unique value proposition: An organization’s strategy must enable it to deliver a value proposition, or a set of benefits, different from what their competitors offer. Robust strategies involve trade-offs. A company must abandon or forgo some product features, services, or activities in order to be unique at others. Such trade-offs, in the product and the value chain, are what make a company truly distinctive. Mutually reinforcing value chains: Strategy needs to be reflected in a distinctive value chain. It also defines how all the elements of what a company does fit together. A strategy involves making choices throughout the value chain that are interdependent; all an organization’s activities must be mutually reinforcing. An organization’s product development, for example, should reinforce its approach to the IT processes, and both should leverage the way it conducts after-sales service. This not only increases competitive advantage but also makes a strategy harder to imitate. Rivals can copy one activity or product feature fairly easily, but will have much more difficulty duplicating a whole system of competing. Continuity of direction: Continuous value delivery to the customers is a necessity and it must always be guided by an agile strategic direction. Without continuity of direction, it is difficult for companies to develop skills and assets or build strong reputations with customers. Agile strategy manifesto can be visually represented in a strategy curve (S-curve). It depicts how a product, service, technology or business progresses and evolves over time. S-curves can be viewed on an incremental level to map product evolutions and opportunities, or on a macro scale to describe the evolution of businesses and industries.On a product, service, or technology level, S-curves are usually connected to “market adoption” since the beginning of a curve relates to the birth of a new market opportunity, while the end of the curve represents the death, or obsolescence of the product, service, or technology in the market. Usually the end of one S-curve marks the transformation to a new S-curve – the one that displaces it. Strategy is the creation of a unique and valuable position, involving a different set of activities. This unique value is customer’s perceived usefulness or desirability of a product, service, technology or business. Value is generally created by radical innovation and retained by value enhancements. The challenge of developing or re-establishing a clear strategy is often primarily an organizational one and depends on its leadership. While nurturing innovation, the leaders must also provide the discipline to decide which industry changes and customer needs the company will respond to, while avoiding organizational distractions and maintaining the company's distinctiveness.One of the leader's jobs is to teach others in the organization about strategy to guide employees in making choices that arise because of trade-offs in their individual activities and in day-to-day decisions. Strategy renders choices about what not to do, which is as important as choices about what to do. 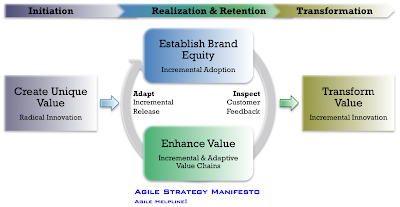 Goal of strategy execution is to minimize value evaporation and maximize value retention. Strategy creates value but some of it evaporates due to poor execution and other organizational frictions. To understand Value Evaporation, assume that the strategy is right and, therefore, value creating. Thus, if there is any loss in value due to a poor strategy, it is not a part of Value Evaporation. A good strategy cannot prevent the evaporation of value. Think of a tropical village that is perpetually short of water. So, the villagers come up with a strategy. It involves digging a big hole in the ground to create a reservoir of water from natural rain. The strategy works. The reservoir fills up. But the villagers forgot how mercilessly hot the tropical sun can be. The reservoir did not last very long. Evaporation returned its water to the atmosphere. For the villagers, what matters is not just how much water was there in the reservoir initially, but how much is retained after evaporation. The same is true for any organization. Its goal is to come up with a strategy that maximizes value retention by incremental and mutually reinforcing execution of value chain. Key for value retention is to inspect and adapt in small increments to utilize feedback from internal and external customers. Following diagram depicts how traditional execution differs from agile execution. In traditional execution, value is stacked and only delivered in the end. On the contrary, agile execution creates a value chain. 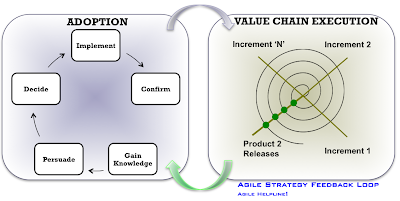 If agile execution is done correctly, value chains start having spiral effects as explained in the following diagram and value continuously grows in each product increment/release. 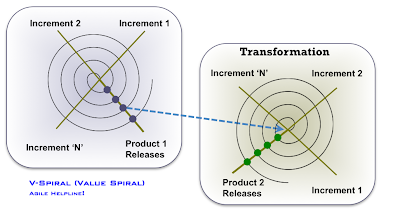 With a good strategy, one V-spiral triggers a new V-spiral through the transformation process. Confirmation (seeking reinforcement for previous decisions, which may involve reversing this decision because of conflicting messages). These adoption phases must be linked with execution in an effective feedback loop to deliver value as per the customer needs. An organization can outperform competition only if it can establish a difference that it can preserve. 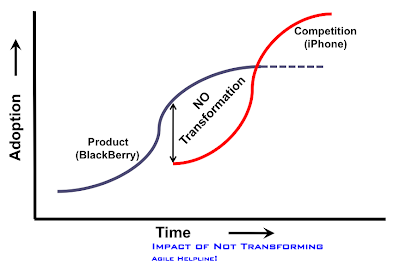 As explained in the S-curve, organizations must continue to deliver greater value to customers by transforming through incremental innovations, which is a result of tweaking existing technology to create the “next iteration” of products. 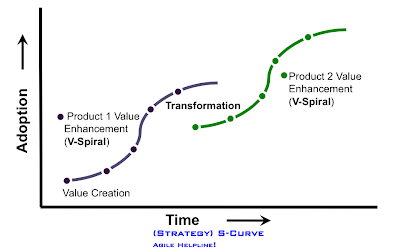 Sometimes, it also involves jumping S-Curves by creating or driving disruptive innovations.In the absence of transformation, value diffusion starts happening and product adoption starts to decline. “Innovators” are venturesome and educated, have multiple sources of information and show greater propensity to take risks. They appreciate technology for its own sake and are motivated by the idea of being a change agent in their reference group. They are willing to tolerate initial problems that may accompany new products or services and are willing to make shift solutions to such problems. “Early Adopters” are the social leaders, popular and educated. They are the visionaries in their market and are looking to adopt and use new technology to achieve a revolutionary breakthrough that will achieve dramatic competitive advantage in their industries. They are attracted by high-risk, high-reward projects and are not very price sensitive because they envision great gains in competitive advantage from adopting a new technology. “Early Majority” is deliberate and have many informal social contacts. Rather than looking for revolutionary changes to gain productivity enhancements, they are motivated by evolutionary changes. Their principal is “when it is time to move, let’s move all together”. 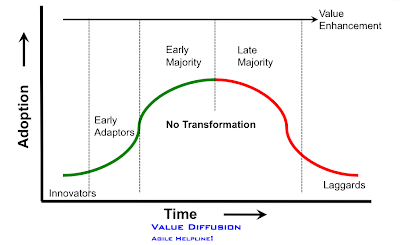 This principle defines why adoption increases so rapidly in the diffusion process and causes a landslide in demand. “Late Majority” is skeptical, traditional and of lower socio-economic status. They are very price sensitive and require completely preassembled, bulletproof solutions. They are motivated to buy technology just to stay even with the competition and often rely on a single, trusted adviser to help them make sense of technology. “Laggards” are technology skeptics who want it only to maintain the status quo. They tend not to believe that technology can enhance productivity and are likely to block new technology purchases. The strategy curve starts reversing when a “late majority” adopts the product because “innovators” and “early adopters” shift to a newer innovation by the competitors. In other words, market share eventually reaches the saturation level. This process results in value diffusion. This situation can be avoided by transforming business through incremental innovation. 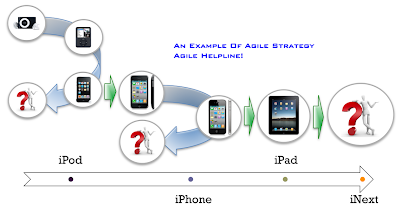 Apple is a perfect example of agile strategy. 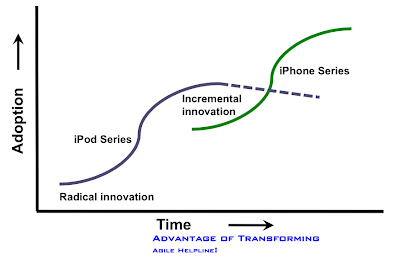 It introduced value through radical innovation of iPod and continuously increased adoption by incrementally adding features to the iPod series. When market started saturating with countless mp3 players, they transformed by incrementally innovating one of their iPod to iPhone. Adoption of iPhone got a good baseline and it kept growing inspite of small decline in iPod sales. Before competition could catch up with Apple's iPhone, it transformed again by incrementally innovating iPad. Apple's continuous innovations are well supported by its incremental and adaptive execution, and a very strong value chain (vision, design, execution, delivery, and support). Many other organizations are able to copy their products but no one is able to duplicate its whole system of competing.